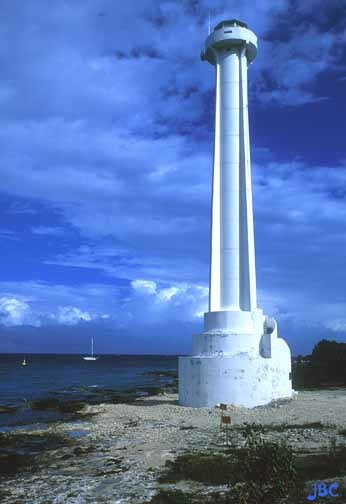 This is the lighthouse, or faro in Spanish, that was completed in early 2000. 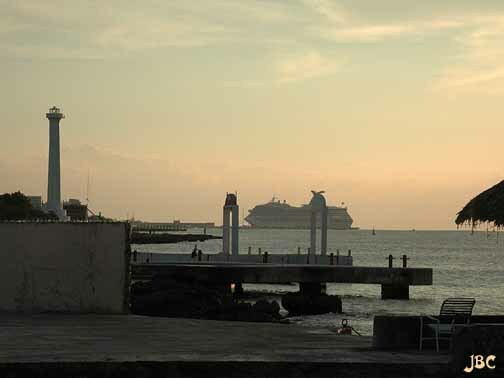 I was in Cozumel for Christmas of 1999 and just this round, odd-looking base was there. No signs to indicate what it was. It is located almost three hundred yards south of my favorite place to stay, Scuba Club Cozumel, about a mile south from town along the same road that Punta Langosta is on. During the Christmas 2000 trip, there it was flashing away, seemed to me about every 12 seconds, with a white light. It is automated and to do so they laid this cable across the ocean to the mainland around Playa del Carmen. I believe I heard that the cables are encased in concrete and has already started becoming part of the reef infrastructure. Sea critters have figured out that they can hide quite well under it. There is a single plaque which is in Spanish but even with our limited ability in that language, we could tell there was no name given. I asked a local divemaster at our resort and he said the area was called Ealetita and across the road was a sign on a telephone pole that used the name Predio Ealetita. There is no point along this stretch of coast that this light could be said to stand on. Great sunsets though. So, this past trip, I caught a few more photos and discovered they call this El Faro de San Miguel, after the only town on the island.